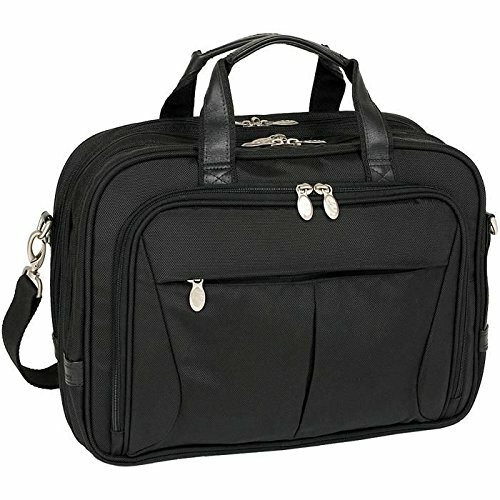 Front organizer with storage space for media devices, cell phone, business cards, key holder and pens. Front compartment features file divider for documents with an expandable feature to provide 30% more storage space. Back Compartment padded with high-density foam to protect most laptops up to 17? in size. Smart Zipper Attachment allows transport on extended handles of other rolling cases and luggage. Advanced, non-slip, shock absorbing neoprene Comfort Flex Shoulder Strap stretches for comfort, alleviating body strain. If you have any questions about this product by McKlein USA, contact us by completing and submitting the form below. If you are looking for a specif part number, please include it with your message.